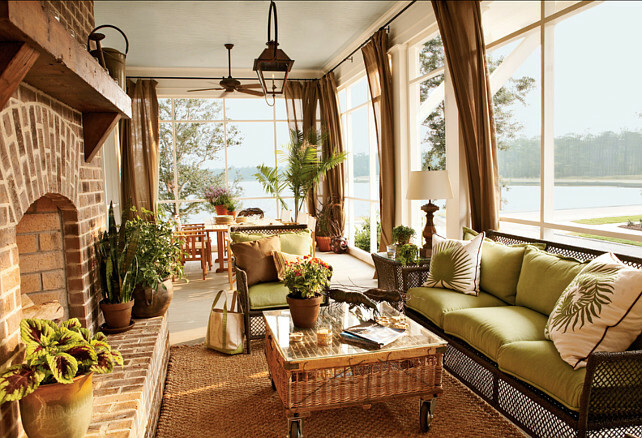 One of my favorite houses is this wonderful home that was once located on North Carolina’s Inner Banks (River Dunes) in Oriental, North Carolina. 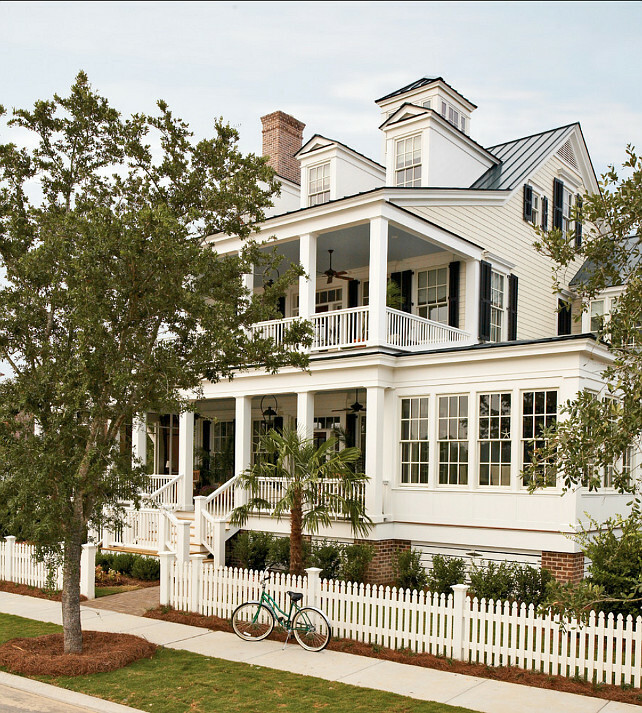 It was designed by Historical Concepts, an Atlanta Architecture and Design firm, to commemorate the 10th anniversary of Coastal Living magazine. Historical Concepts was inspired by nineteenth century coastal design and envisioned a home that could have belonged to a sea captain back in the day. 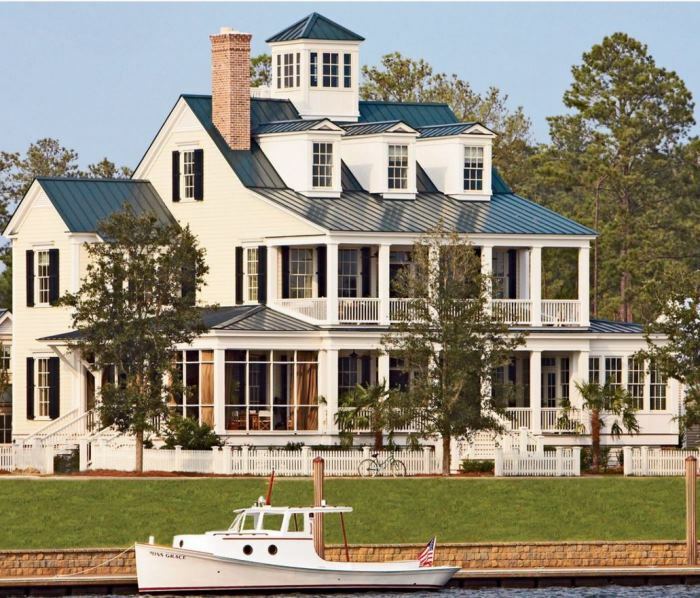 They named the home, Captain’s Watch, and it had everything you could ever want in a home, including lots of great porches. It even had a crow’s nest up top to take in the great views. Sadly, this happened. Lightening got it, or at least that’s what they think happened since there was a lot of lightening in the area at the time. 🙁 It burned all the way to the ground in about 30 minutes. I wish someone would wave a fist in the face of Mother Nature and rebuild it, if not where it stood, at least in a new place. Here’s how the entry looked. 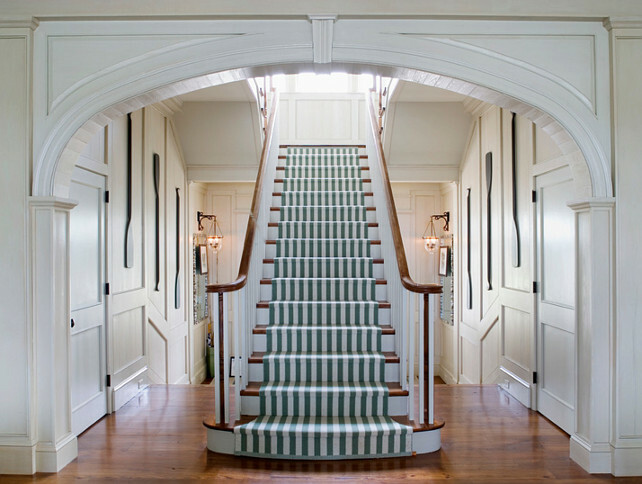 The beautiful interiors were created by designer, Tammy Connor. 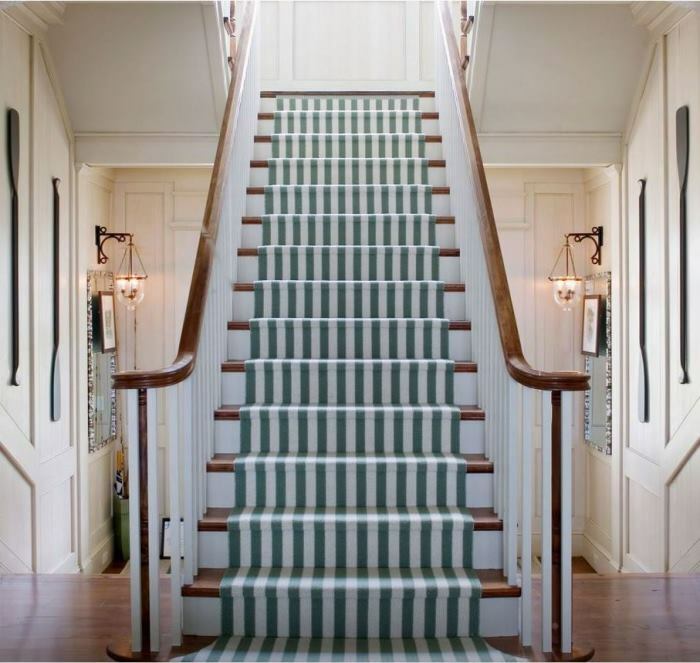 Love the striped runner going up the main staircase. 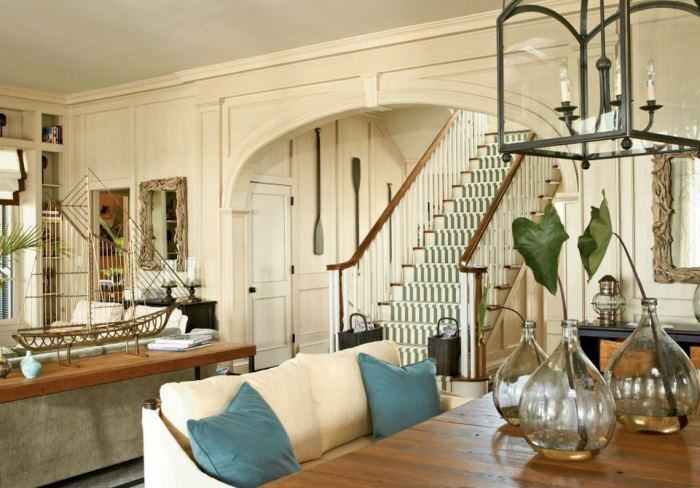 The information at Historical Concepts (where these photos were found) states it has wood walls and custom millwork. 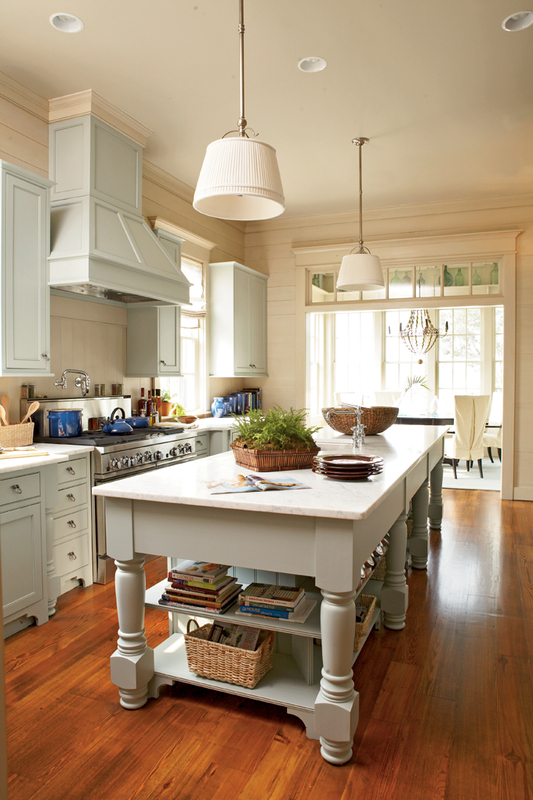 The cabinetry is painted in a sailcloth white. I love the softness of that color, so pretty! The color palette of the home’s interior, furnishings and art was drawn from the colors found in the ocean, wetlands and coastal vegetation. Notice the front of the refrigerator…very unique. I think this is the breakfast area since the home has a separate dining room. The dining room had a wonderful coffered ceiling. Notice the shelf built near the ceiling for displaying pretty bottles. 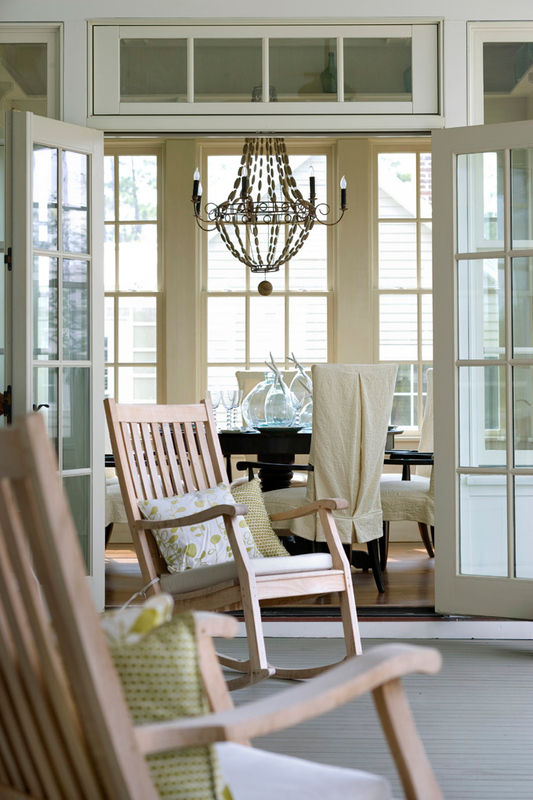 The dining room leads out onto one of several porches. 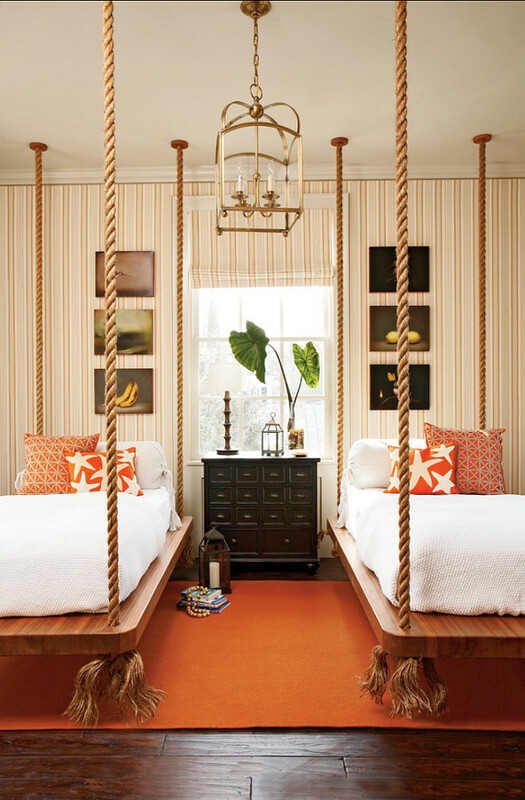 Here’s a fun idea for beds. You could gently sway yourself to sleep at night. See that third level with the dormer windows…let’s check it out. It’s almost like another little apartment. 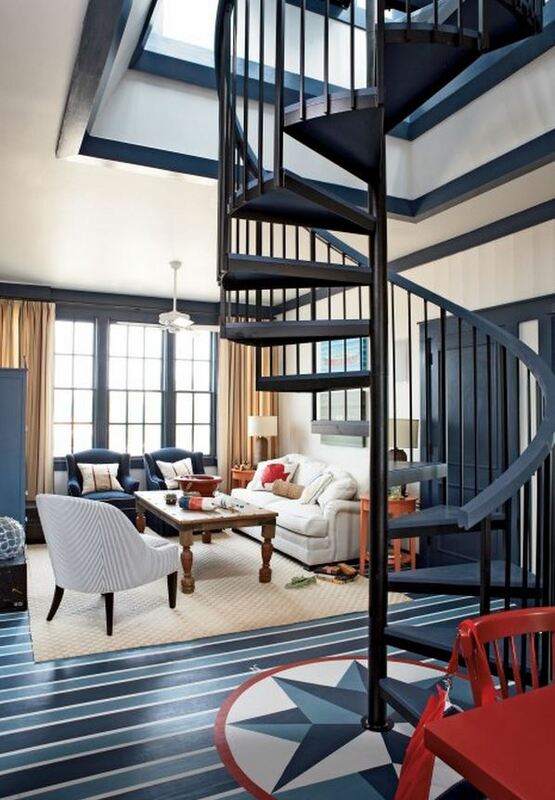 Notice the amazing floor painted with nautical stripes and a compass design. It has a small living room area and a mini kitchen with a place to eat. Notice the stairs there on the right, those lead up to the Crow’s Nest. 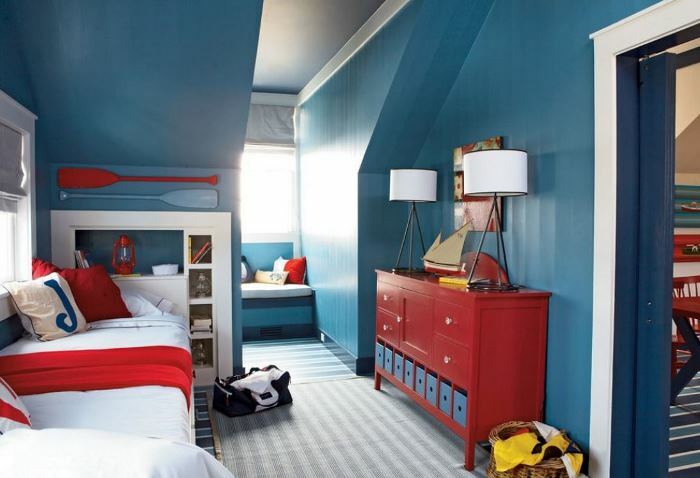 The bedroom on this level was decorated in a nautical motif with sleeping quarters for two. 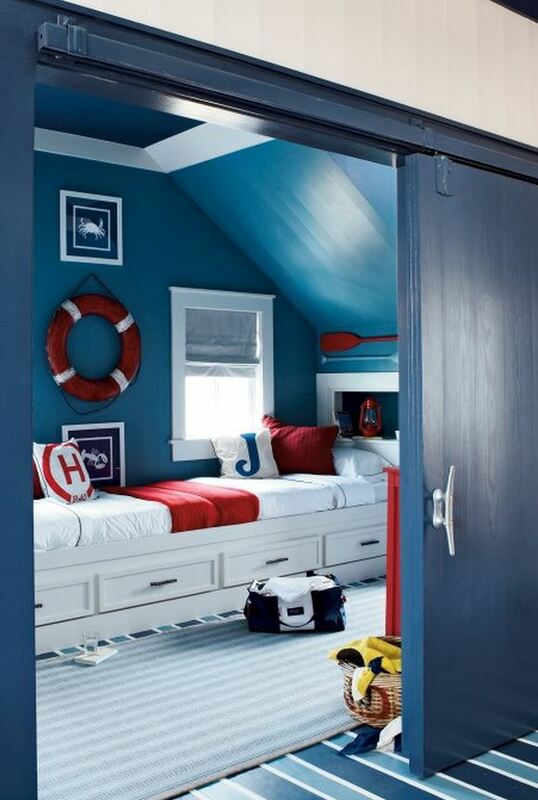 Great design in vibrant red, white and blue. 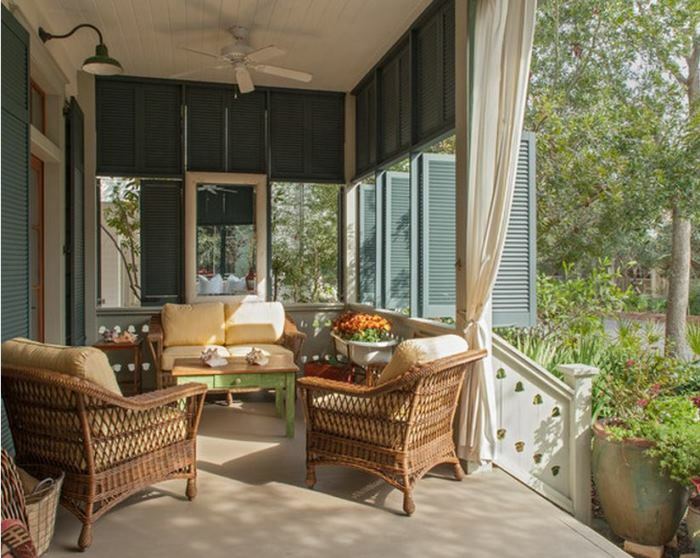 See the screened porch there on the left? It had a fireplace for chilly evenings. 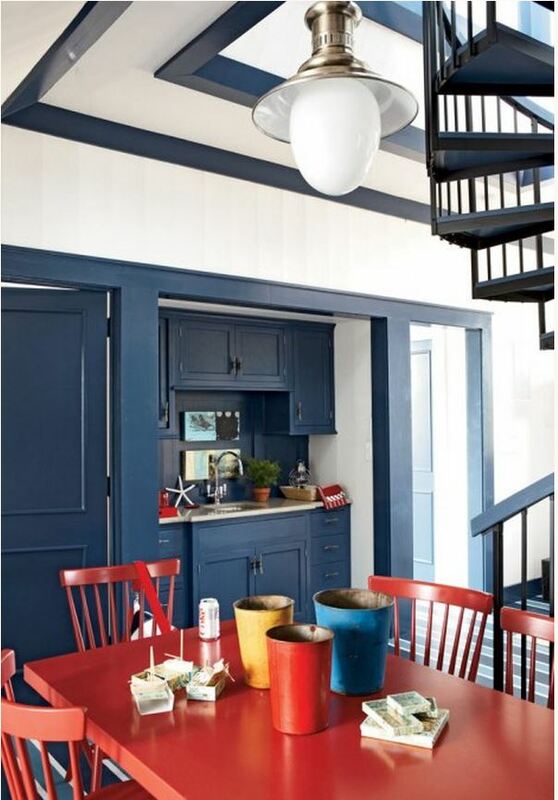 The ceiling on the upper porch (2nd story) was painted a soft haint blue. Hard to believe this house is no more. Hope someone rebuilds it some day. You can read more about this beautiful home at Historical Concepts where these photos were found. A Beautiful Beach House That Comes With Its Own Lighthouse! Is This Beach House New or Old? Susan, When did this happen?…yesterday (5/11/2015)? No, but I just found the article and couldn’t believe it’s gone. I’ve always admired that home on the Historical Concepts site. Click on that link under the picture of it burning and it will take you to the article. The home was built in 2007 and burned in July 2010. Oh that is just awful! And, wow, how fast it burned down. What a beautiful home it was. So sad. Thank you for posting this; it is a shame that house is no more. I live in Charlotte, NC and do not get out to the East end of the state very often especially in these times. Maybe your wish will come true and it will be rebuilt. Surely someone had fire insurance on it. Hopefully, next time, it will be built with a lightning rod system too. I left the south and moved west. I have seen hundreds and hundreds of houses as my husband is a realtor. This house is absolutely my dream home! How sad that it is never more. Thanks for posting it. This has long been a favorite home of mine, also. I am so sad to see the loss of this beautiful home. I guess even that great metal roof didn’t protect her in this vulnerable moment. Thank goodness we have beautiful pictures to remember her by. Me again. Please continue with these home tours. They are enjoyed greatly and I’m sure by everyone else. Oh my gosh how sad. What a gorgeous house. Hopefully someday it will be rebuilt. Thanks for sharing Susan. Hopefully, the next home would have a sprinkler system. I could see an older home having a devastating fire like this but not a modern home. Maybe there was one and it didn’t help. Would be interesting to know. OH NO HOW SAD>>> WHAT A BEAUTIFUL HOME IT WAS>>> THEY MUST BE DEVASTATED ..
OH NO! This is just plain tragic. Thank goodness no one was hurt. Saying Prayers for this family. How very sad! Oh, there’s a real grief about such beauty being taken away. Our wood stove expert mentioned once that homes with metal roofs were quite susceptable to burning to the ground. The metal roof acts like an iron stove, forcing the heat back into the house and refueling itself, especially buildings w/concrete block walls as we see here in the Great Plains. Oh Susan, this made me cry. What a beautiful home. So glad there were at least pictures to show how beautiful it was. I’m so sad. Hope someone does rebuild this home. I am saddened by the loss of this beautiful home too. I love the Outer Banks and am looking forward to visiting there again soon. I wish I could have been able to see lovely home in person. I live not too far from this little community and I had the pleasure of touring this house after it was completed. There is so much more to this house than I have seen in pictures. It was in a small village where all the houses have the historical touches such as gas lanterns, wood siding, carriage houses, etc. The village has an old looking gas station with old timey pumps. It also has the cutest small chapel that wouldn’t seat very many people. The house burned down a few years ago but I can’t remember exactly what year. 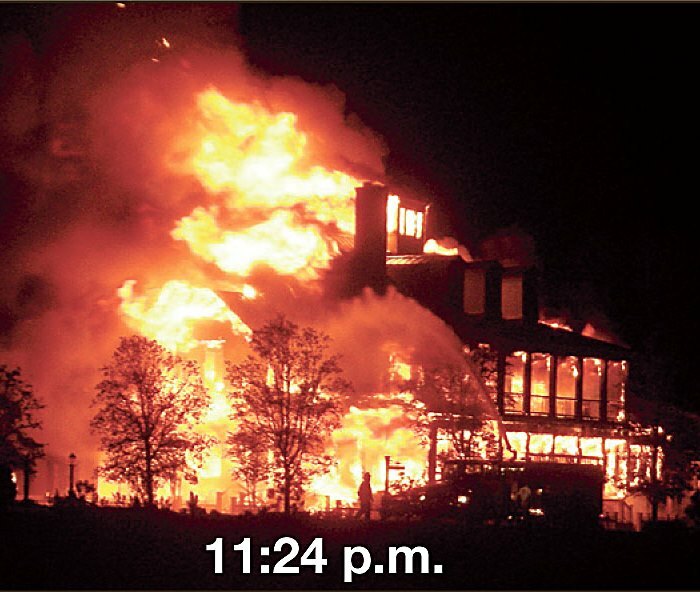 I would have to think that the carriage house burned as well because it sat directly behind the main house. Anyone visiting this part of North Carolina (not far from historic New Bern) should absolutely visit this community. It will take you back in time with the narrow streets and beautiful homes-all built to resemble homes of times past. It is also on the water with a marina. Mary, thanks for describing the area, it sounds wonderful! I would love to see it in person. Do you know if a house was ever built back on that property. I was just wondering what is there now. Susan, I think they rebuilt it. I have a friend in real estate and she feels confident that they did. BTW love your blog. Thanks so much, Mary! Oh, I truly hope so! That would make my day to know it got rebuilt. If it was rebuilt, I hope they recreated it exactly as it was…but maybe with a lightning rod…or, ten! Susan, I hope they did too. It was beautiful. I’m certain a house of some sort was rebuilt but I’m not sure if they recreated that particular one. It was positioned to be the star of the show so I would think that they rebuilt something to be as impressive. I still in my mind think of it as the “show” house because they advertised it for a long time for tours. I’ve tried calling twice so if I get more information I will let you know. You’ve got me curious. Maybe a Sunday afternoon drive will do it. Mary, if you do drive over to see what’s there now, would you take a picture of it with your cell phone or a camera? I would love to see what is there now. I hope it was rebuilt! Sure Susan. It may be a couple of weeks before I can go. I will have to go on a weekend because I work way in the opposite direction. It will be nice to visit the village again after so many years. Did you know that you can rent 1,2 and 3 bedroom cottages? Yeah, they are really beautiful! No, I didn’t know that. I bet it’s a pretty place. Sad, sad news! I agree, this was a spectacular home. What a shame. My heart breaks for the owners. You know it must have been filled with beautiful things as well. A house fire is an awful thing to experience. My house burned when I was 14. Pictures were the worst thing to loose. I’m so glad they have wonderful pictures of this one. We can look at them and still dream. It was truly great! 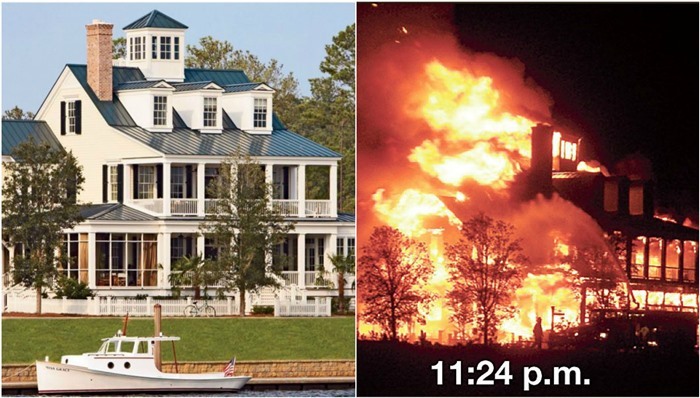 The picture of the burning house reminds me so much of the picture we saw of Greenwood Plantation (St. Francisville LA) when it was struck by lightning and burned. Captain’s Watch was a beautiful home. It is terrible that it is gone. I had a fire in my house in Dallas many years ago and it is a terrible thing. I hate to see any house or building burn. It was many years before I could stand the smell of smoke. It would be so nice for someone to use the plans for a new home. Oh, Susan, how tragic that this home was a complete loss!!! It’s truly one of the most beautiful homes I’ve ever seen. I honestly think it compares with some of the movie homes you’ve posted on BNOTP. SO gorgeous and such attention to detail!!! 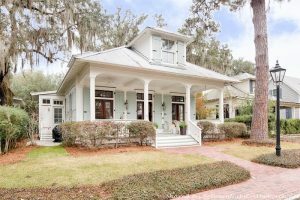 If I ever build a cottage, I would love the first floor of this home to be my inspiration – with the bank of windows in the kitchen nook and that gorgeous living, dining room and screened porch!! That is truly sad (even though it has been nearly 5 yrs. ago). The perfect house in the perfect setting!!! How shocking! It’s hard to believe it burned so fast- that’s terrible! It sure was a beautiful home! Oh I am so sad, Susan. What a magnificent home. I do hope it can be rebuilt with all of the beautiful details. What a tragedy, such a beautiful home. I home no one was hurt in that devastating fire. The whole inside of the house was just gorgeous, just my *cup of tea*. Would one have the heart to build all over again. One friend did just that, she lived in our previous neighbourhood, her daughter and friends when young, left a live candle burning on the hot tube and went to bed. The mother was on a shift at the hospital and it was the young son who woke everyone up. It was an older home, but she built a lovely one on the same lot, hubby did a lot of work in it. After that, I began using the flameless candles. Oh Susan…this is just heartbreaking…such beauty and history….gone! You just never know….we must live in the moments of life….just a gorgeous, gorgeous home. What a gorgeous home…it was. So sad to see it engulfed in flames. Thank you for sharing the photos of the beautiful interior and exterior, Susan. At least we can carry those images in our hearts. I can only echo the sadness of the preceding comments…. Thank you for sharing the photos…. truly a gorgeous dream home. It makes me so sad to see this happen. My parents had a fire in 1992 and they were abel to salvage some things from the house but it was too far gone to repair the house and they needed to tear down the 1896 Queen Anne and rebuild a new house. Hooked on Houses did a piece on this too. Enter name on her site and read more including people that toured it when it was open. The chapel next door was damaged but saved. Such a waste to see something so lovely burn like that,maybe we should start putting lightning rods are our homes again, you think they had one on this one ? Sad really. I am so glad you post things like this. This beautiful home will be remembered and enjoyed by hundreds for years to come within your archives! 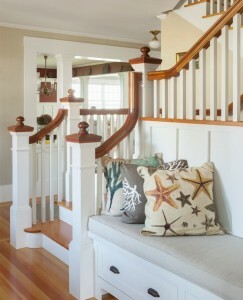 There will be others that see this and each will incorporate some little piece of this home within their own homes, design a new home after some of the characteristics of Captain’s Watch and it will live on…just in a hundred different little ways…. 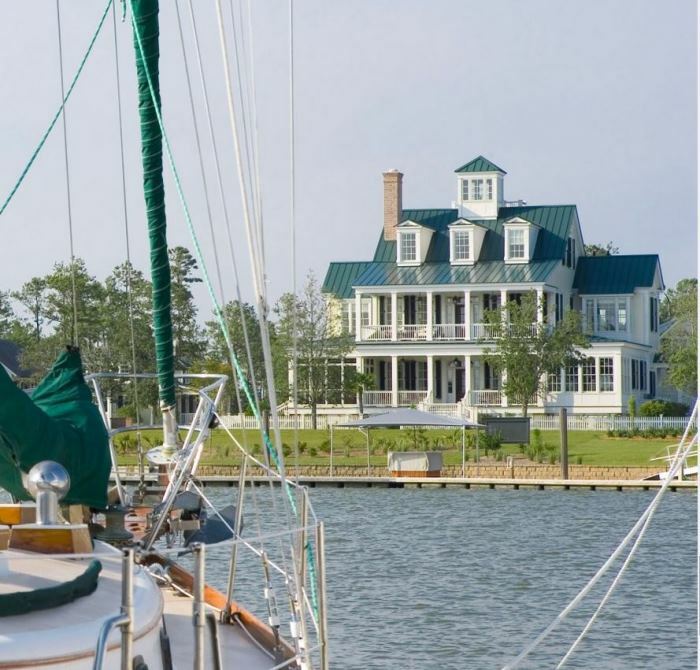 I was wondering if this lovely home, (that sadly is no more) ,was the one used in the movie”somthings gotta give….” I adored that home and the colors in it……so sad to see it come to such a tragic end…. As so many commenters have said, it is a sad thing to lose a house of such beauty. The only comfort is that at least it wasn’t a historic house! I do hope they were able to recreate or improve (although that would be a tall order) on this house. I’m sure others would be as interested as I would to see pics of the replacement house! Thanks for posting, Susan! P.S. That was a very interesting comment by Julie Williams above, about the metal roof acting as a iron stove effect! I never thought of it like that, always assumed (and you know what they say about that…LOL!) that a metal roof would be less flammable and therefore a help in a fire situation! I know…I thought the same thing, that it would be less flammable. I think I read in that article I linked to under the picture pf the house, that they said the metal roof actually intensified the heat. I still like metal roofs, though…love the look and durability. Such a beautiful home. Sad to see it go in such a horrible way. I’d love to sit on that second story porch all day and night. Wouldn’t it be lovely to sit outside during a not so terrible rain storm? The kitchen is the color that I want to make my new place (whenever that is).